Such a great feeling to finish another UFO. 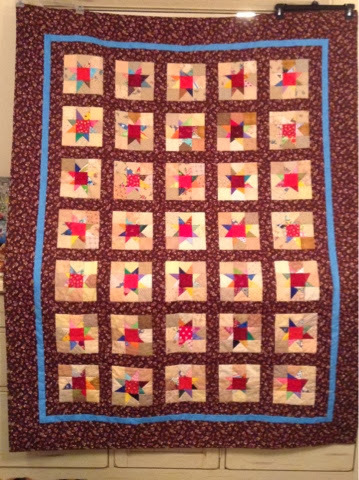 Maverick Stars was discovered on Quiltville. What a fun quilt to make. Thanks, Bonnie! That is a spectacular quilt! I love those wonky stars perfect for scraps or specially chosen fabric. Thanks, Ann. Great scrap project! Great job! Your quilt turned out beautiful! ---"Love"
Your quilt is so pretty, I love the colors! Congratulations on a finish! Thank you,Marsha. It does feel good to finish one of many UFO's. Gradually marking them off my list.